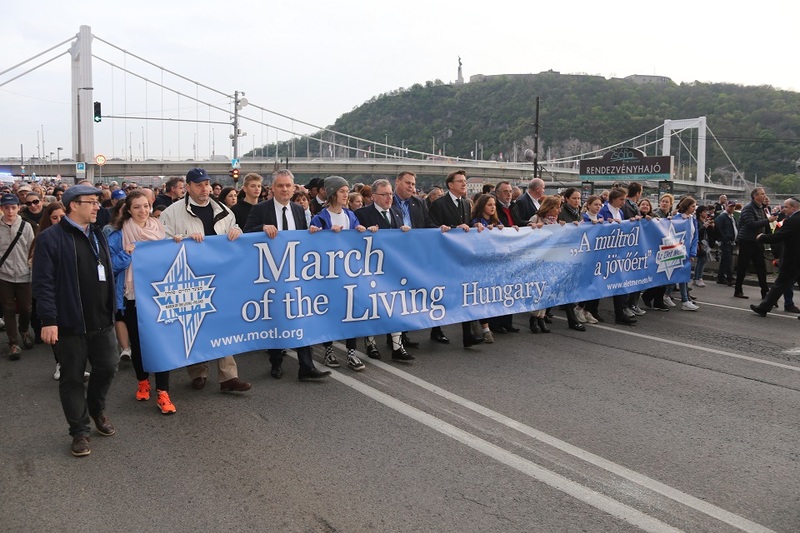 The march by torchlight – attended by upwards of 10,000 people – is an annual event to mark Hungary’s Holocaust Memorial Day. This year it commemorated the life and work of Scottish missionary Jane Haining, who protected her Hungarian Jewish pupils during WW2, and who died in Auschwitz. Mr Mundell was asked by the organisers to speak at the event and lead the march. 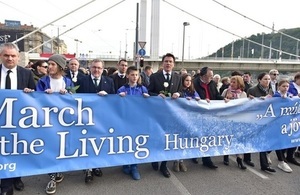 It was a huge honour, and a great privilege, to lead the March of the Living to mark Hungary’s Holocaust Memorial Day. 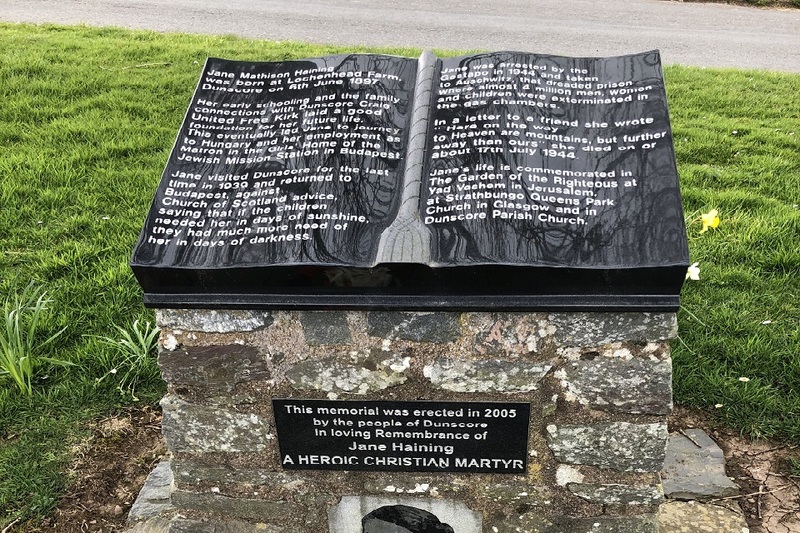 I was very proud that the 2019 march remembered Scottish missionary Jane Haining. An extraordinary, brave and selfless woman, Jane Haining sacrificed herself to protect Jewish schoolgirls in Budapest during the Second World War. Her unwavering devotion saw her lose her life in Auschwitz 75 years ago, aged just 47. She is a hero of which all of Scotland, Hungary and the world can be proud. The Holocaust was undoubtedly one of the darkest times in human history, but the courage and personal sacrifice of individuals like Jane Haining give us hope for the future. While in Budapest Mr Mundell also visited the Dohány Street Synagogue, and joined worshippers at the St Columba’s Church of Scotland (next door to the former site of the Scottish Mission school where Jane Haining worked). Jane Haining’s service and sacrifice shows that caring for people from different backgrounds in no way compromises our faith. In fact, it just might be the fullest expression of it. Since I’ve had a chance to hear women share their childhood memories of the Scottish Mission, I treasure every opportunity to pass on those stories. As an English-speaking church in Budapest with an international congregation, it is natural for us to be involved in outreach among refugees. Compassion and hospitality is in our church’s DNA. Jane Haining (6 June 1897 – 17 July 1944) was a Church of Scotland missionary. She worked in Budapest from June 1932 as matron of the Scottish Mission School, a boarding house for Jewish and Christian girls run by the Scottish Mission to the Jews. After World War II broke out the Church of Scotland advised Haining to return to the UK, but she decided to stay in Hungary to look after her Jewish pupils who were facing persecution. She wrote at the time “if these children need me in days of sunshine, how much more do they need me in days of darkness?”. Ms Haining was arrested by the Gestapo in April 1944 on a number of charges, including that “she had wept” when sewing the yellow stars on the clothes of her Jewish pupils, as required by law. She died in Auschwitz-Birkenau a few months later. Ms Haining was recognized in 1997 by Yad Vashem (the World Holocaust Remembrance Centre in Israel) as ‘Righteous Among the Nations’, an honour awarded to non-Jews who risked their lives to save Jews during the Holocaust. Jane Haining was born in the village of Dunscore in Dumfrieshire. A cairn in her memory stands outside Dunscore Parish Church, and a memorial to her life was opened inside the Church in January 2018. It features photographs, letters, documents and other personal effects relating to the missionary. 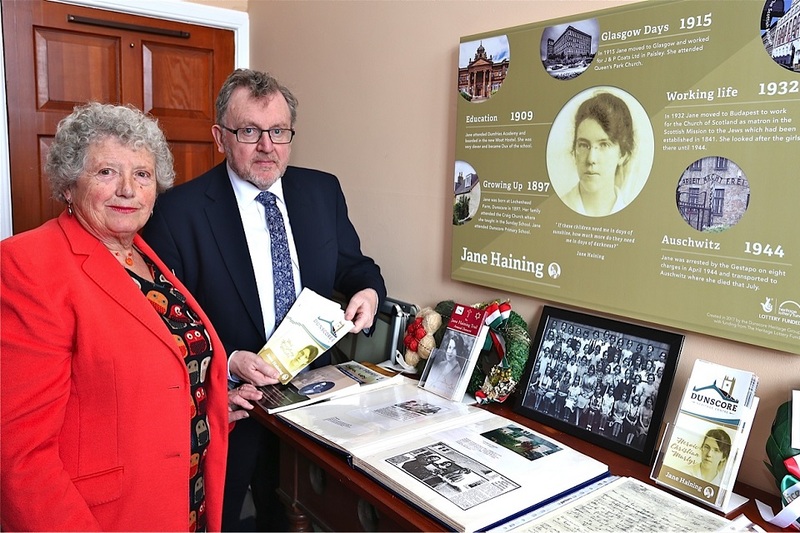 Mr Mundell visited the memorial and heritage centre just ahead of the march [on Friday 12 April].